2017 Oregon Regional MATE ROV Competition. Photo: Daniel Cespedes. 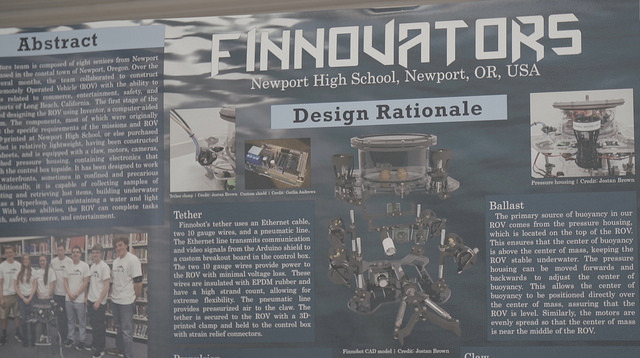 A new video shows how Oregon students are preparing for technical careers by building underwater robots for an annual competition in which they demonstrate their skills in front of engineers and scientists. The video, which was produced by Oregon State University with funding from Oregon Sea Grant, was filmed during the 2017 Oregon Regional MATE ROV Competition, which Oregon Sea Grant coordinates. It is one of about 30 regional contests around the world in which students qualify for an annual international competition. Contestants often have to troubleshoot in real time. Photo: Daniel Cespedes. 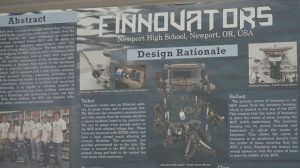 “Our goal is to really get students interested in science, technology, engineering and math — or STEM — and connect them with marine technicians and engineers and marine scientists that utilize remotely operated vehicles, or ROVs,” Tracy Crews, the manager of Oregon Sea Grant’s marine education program and OSU Extension Service, said in the video. Thirty-one teams from Oregon participated in this year’s competition, which was held in April at the pool at the Lincoln City Community Center. More than 200 students from elementary school through college demonstrated devices they built. “For students who struggle with conventional school, it’s a chance for them to really shine,” Melissa Steinman, a teacher at Waldport High School, said in the video. 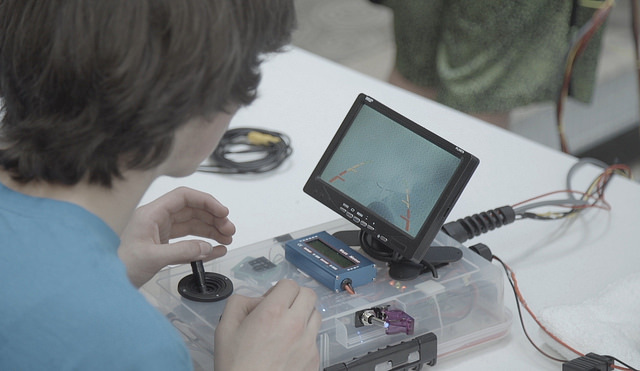 Contestants operate their underwater devices remotely, and sometimes with a video monitor. Photo: Daniel Cespedes. A new theme is chosen each year. This year’s theme highlighted the role of remotely operated vehicles in monitoring the environment and supporting industries in port cities. Like port managers and marine researchers, the students guided their robots through tasks that simulated identifying cargo containers that fell overboard, repairing equipment, and taking samples of hypothetically contaminated sediment and shellfish. Students also presented marketing materials they created and gave engineering presentations. “A couple of teams, they just nailed it,” Ken Sexton, one of the judges and owner of The Sexton Corp., said in the video. Contestants in MATE ROV competition learn engineering and problem solving skills. Photo: Daniel Cespedes. 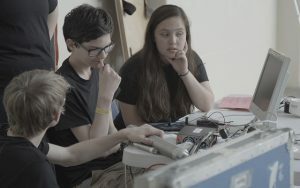 Students were also tasked with creating mock companies, thinking like entrepreneurs and working together to “manufacture, market, and sell” their robots. The students gained project management and communication skills as they managed a budget, worked as a team, brainstormed solutions and delivered presentations. “It’s really good problem-solving, teamwork, just everything all together. It really helps … you have better skills for the future,” said Kyle Brown, a junior at Bandon High School. Robotics poster presentation by a team from Newport High School. Photo: Daniel Cespedes. Posted in Community Outreach, Extension, Partnerships, Sea Grant. 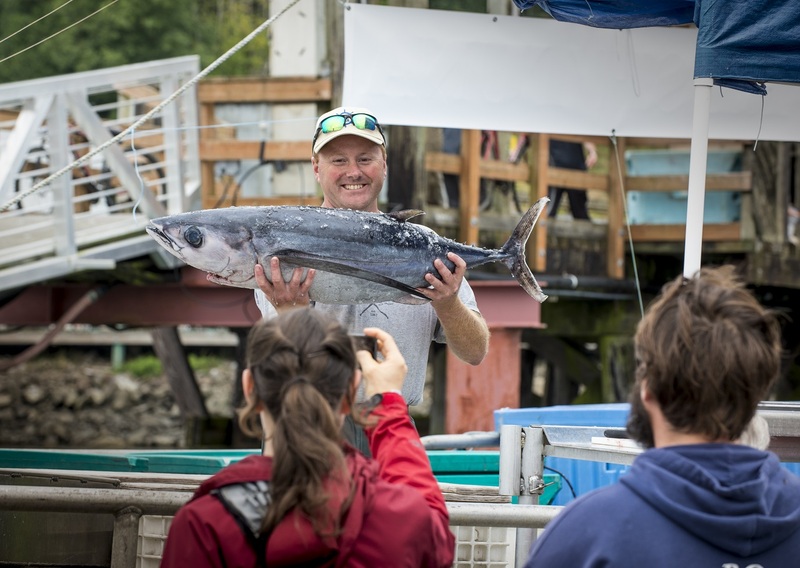 Joe Phillips, of fishing vessel Triggerfish, shows off an albacore tuna during Oregon Sea Grant’s Shop on the Dock tour in Newport. Engagement takes many forms, and in this case wears the dual banners of education and economic development. In Newport, Ore., Oregon Sea Grant created a consumer seafood education and shopping program called Shop on the Dock. Shop on the Dock is an opportunity for coastal visitors and residents to learn what seafood is in season on the Oregon coast, meet the people who catch the fish and learn how to tell when the seafood they buy is of high quality. Oregon Sea Grant staff lead the tours, describe the fisheries and help those who want to navigate the process. The 90-minute tours have taken place for the past four years on several dates in July and August. The tours are free and on a first-come, first-served basis. Tours again will be offered in 2017. Those who plan to buy seafood direct from the fishermen are asked bring cash and a cooler with ice. Comfortable shoes with good traction are important, as the tours cover some distance on working commercial fishing docks. Don’t forget about the Oregon Sea Grant app called Oregon’s Catch. The app identifies locations along the entire Oregon coast where people can buy fresh and frozen seafood caught by Oregon fishermen. Posted in Community Outreach, Extension, Sea Grant.